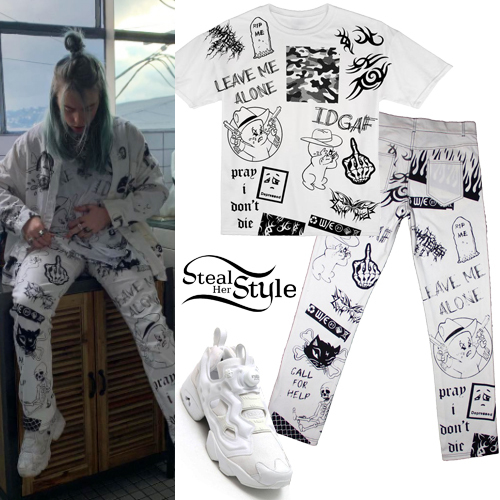 Billie Eilish posted a picture on instagram wearing the Leave Me Alone Tee ($45.00), Leave Me Alone Tattoo Jeans ($280.00) and Leave Me Alone Jacket (Not available online) all by Whatever 21, with Reebok x Atmos Instapump Fury OG Sneakers (Sold Out). Emily Ratajkowski visited Xochimilco in Mexico City wearing a Donni Lucky Tube Top ($84.00 – wrong color), Re/Done Comfort Stretch Skinny Jeans ($125.00), Stalvey Alligator Top Handle 2.0 ($12,500.00), Rixx Eyewear Scarlett Sunglasses ($135.00) and Reebok Classic Leather Sneakers x Face Stockholm ($49.00). Gigi Hadid was spotted out and about in New York wearing a Brooklyn Crop Hoodie ($215.00) and matching Brooklyn Sweats ($225.00) by Cotton Citizen, Acne Studios Ribbed Beanie ($160.00 – similar style) and Reebok Aztrek x Gigi Hadid Classic Sneakers ($110.00). Emily Ratajkowski was spotted leaving ‘Jimmy Kimmel Live!’ after her appearance in Hollywood wearing a Paris Georgia Terri Jacket ($651.00), Hayward Mini Shopper on a Chain ($1,290.00) and Reebok Classic Leather Ripple Sneakers ($45.00). Gigi Hadid was spotted out and about in New York wearing Cotton Citizen Manhattan Zip Hoodie ($250.00), Re/Done High Waist Crop Jeans ($250.00), Prada Monkey Print Leather Bowling Bag ($2,450.00), Vogue VO4106S Sunglasses ($63.44) and Reebok Classic Nylon Archive Sneakers ($75.00).